At one of my other blogs I have been participating in a book review round up for children's nonfiction for a number of years called Nonfiction Monday. The organizer, Anastasia Suen, has recently changed the format so now all the reviews are posted Mondays on the new Nonfiction Monday blog. Today I thought I would participate here at Growing with Science with a review of a picture book about Pluto. If you are interested in children's nonfiction, you might want to go visit the blog and see what interesting books other bloggers have found. With the the change in 2006 from having nine planets in the solar system to only eight, children may be wondering what happened to Pluto. Why isn't it a planet any longer? 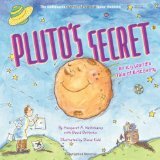 Pluto's Secret: An Icy World's Tale of Discovery by Margaret Weitekamp, with David DeVorkin, and illustrated by Diane Kidd uses a whimsical approach to explain the discovery of Pluto, its history and how scientific classifications change as we uncover more information about the world around us. The premise is that Pluto has a secret, which is that it isn’t a planet but part of a different phenomenon altogether. The cartoon illustrations of a smiling Pluto reveal right away that this isn't going to be a deeply serious nonfiction book. The lighthearted tone of the text confirms that this is meant to be a fun, entertaining look at what happened. That doesn't mean that the information is lightweight, however, because the book is published in association with Smithsonian's National Air and Space Museum where the authors and illustrator work. It is well written and has a good amount of depth. What did happen to Pluto? In a nutshell, astronomers found a group of objects that also orbit around the sun near Pluto. Together they form what is called the Kuiper belt. Many of these newly discovered objects are nearly as large as Pluto, and one, Eris, was actually thought to be larger than Pluto. Eris would have been the 10th planet in the solar system, except in 2006 astronomers sat down and decided to set a strict definition of what a planet should be. As a group they decided that a planet has to orbit the sun, have a rounded shape, and also to have a clear orbit of its own. Pluto and the other members of the Kuiper belt fail the last criterion. Therefore, they are now called "dwarf planets." Because they are for the most part orbiting beyond Neptune, they are also called "trans-Neptunian objects." The only dwarf planet the orbits nearer to the Sun than Neptune is Ceres, which is found in the asteroid belt between Earth and Mars. Top row (left to right): Eris and its moon, Dysnomia (not "Xena"); Pluto and Charon; and Makemake. 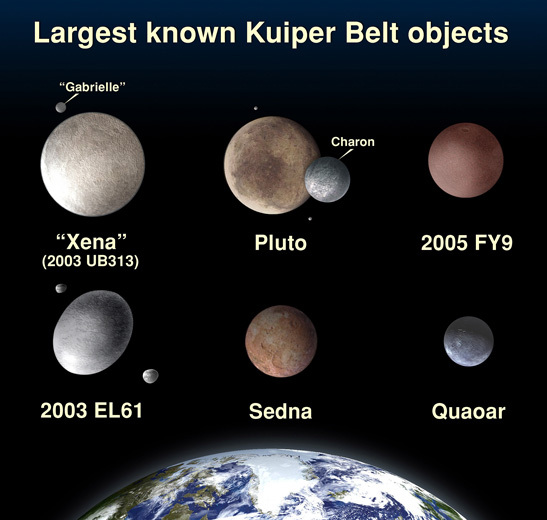 Bottom row (left to right): Haumea and its moons; and Kuiper Belt Objects Sedna and Quaoar. Back to the book, Pluto's Secret is a lively introduction to the the history of Pluto and how science works. It definitely would be a useful resource for a unit on the solar system or to accompany a trip to an air and space museum. Disclosure: I am an affiliate with Amazon so I can provide you with cover images and links to more information about books and products. As you probably are aware, if you click through the highlighted title link and purchase a product, I will receive a very small commission, at not extra cost to you. Any proceeds help defray the costs of hosting and maintaining this website.